"I think we've got another shark problem." Just when movie-goers thought it was safe to head back into the water, Universal unleashed the sequel to their 1975 megahit, Jaws. The appropriately titled Jaws 2 arrived sans Spielberg and carried with it a troubled production that rivaled its predecessor. Of course, the film did return one important element: the giant man-eating shark, which is all I cared about when I first saw the film about twenty years ago when I was introduced to the series. At one point, I probably watched this one more than the original itself, and my aunt (the same one that gave me Jaws on VHS) gave me the novelization (which ended up being quite different from the film itself). It's been a few years since the giant Great White Shark's reign of terror ended in explosive fashion at the hands of Chief Brody, and a couple of divers are scouring the ocean floor and find the Orca, the doomed vessel from the original film. Much to their inconvenience, they also discover another shark that subsequently begins feasting on the inhabitants in the waters off of Amity Island. Of course, Chief Brody immediately suspects the presence of another shark, while the town council (again headed by Mayor Vaughn) is still too concerned with the town economy. As a result, a group of the town's teens, including Brody's oldest son, Mike, become shark bait when they go day-sailing. It's too easy to say that the biggest weakness of Jaws 2 is that it's simply not Jaws. However true that might be, it's also rather unfair; after all, how many films are able to live up to such a lofty standard? While the Spielberg magic is gone here, what remains is still an entertaining film by any other standards because it does deliver some decent shark action, it's fairly suspenseful, and it does have a rather awesome climax. Plus, returning star Roy Scheider arguably delivers a better, more complex performance as Brody, who becomes a paranoid wreck when the shark begins wreaking havoc. That said, it's also fairly easy to pinpoint why the sequel lacks in comparison to the original: Scheider is the only remnant of the original triumvirate in the original. Robert Shaw wasn't back for obvious reasons, and Richard Dreyfuss was off (along with Spielberg himself) filming Close Encounters of the Third Kind. As such, we're left with Brody and a few other original cast members, including Lorraine Gary who has very little to do here. Rounding out the cast is an assortment of teens, which registers as fairly average as far as horror films go. None of them (including Mike Brody himself) are particularly developed well, but the actors do their best with what's presented to them. Thus, the film just doesn't give us many interesting characters to follow besides Brody, and the film actually divides time between him and the teens. Interestingly enough, the film almost seems to set up Tina Wilcox (Miss Amity Island) as the lead teen, as she serves as the vehicle through which bad things are witnessed, including a water-skiing/boating incident and the dead orca whale that obviously had an encounter with the great white (a nod to Dino De Laurentiis's Orca). However, this character is ultimately inconsequential to the story, and one has to wonder if we should have been spending more time with Mike (who similarly becomes inconsequential by the film's end). This is emblematic of the fact that the script for the film isn't the strongest or tightest ever written, as it's rather disjointed in bringing the main characters (Brody and the teens) together for the climax. However disjointed the script may be, the film still manages to rise above and become a better-than-average "nature runs amok" film because director Jeannot Szwarc takes a different approach than his predecessor by revealing the shark as much as possible. Of course, this is probably possible only because the mechanical shark actually worked, but it ends up being a major boon for Jaws 2 because there are some great shark moments, including a confrontation with a helicopter and its pilot. The fact that the shark is seen so much is representative of the fact that Jaws 2 is much more of a standard horror film than the original. This is best seen in the fact that the final act essentially reverses the conceit of the original. Whereas the first film turned the hunter (the shark) into the hunted, the final act here revolves around the shark stalking the teens who have become stranded in the middle of the ocean. Essentially, it's like a slasher film set on water, and the idea is certainly terrifying. For the most part Szwarc handles this well, as the scenes are tense and the stakes are high. There are a few cornball moments tossed in here that kind of dilute the horror, but it works for the most part. 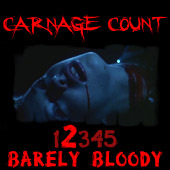 Also, in good sequel fashion, the body count is higher, yet, surprisingly enough, the gore is toned down quite a notch. All in all, Jaws 2 is still very entertaining, particularly at its best moments. While it's not nearly as stylish or well-done as the original, it still delivers some solid thrills at sea. It should also be noted that John Williams returns with an excellent score that actually rivals the original film (the main Jaws 2 theme is among some of the best music Williams ever composed). The film has been released once by Universal in a decent one-disc package that includes a decent widescreen transfer (there's some edge enhancement and softness, but nothing major), and a solid 2.0 mono soundtrack. There's also a decent amount of special features, including a documentary that details the difficult production of the film (Szwarc actually was the second director for the film, and the documentary tells you just how close we were to Spielberg helming the film). Among the other features are some deleted scenes, a feature on the music, production photographs, shark facts, storyboards, and the film's trailers. Basically, I think this is the best we're ever going to get for Jaws 2, so I don't see any use holding out for this solid thriller. Jump right in, the water's fine. Buy it!